Affle’s mTraction FaaS or mFaaS has been recognised and awarded as the industry wide best Big Data Technology Product of the Year at the prestigious IAMAI India Digital Awards. 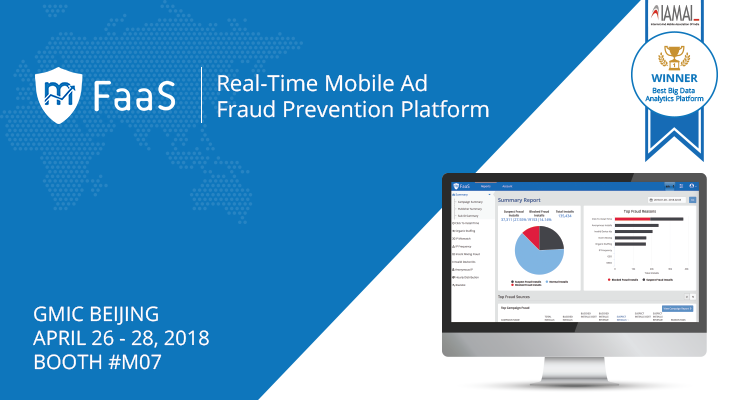 mFaaS enables mobile advertisers and networks to detect and prevent mobile ad fraud not only at a post-mortem level, but during runtime. It processes massive volumes of click and conversion data using multiple algorithms to detect patterns of indicative or definitive fraud, and is currently used globally to detect and reduce ad fraud for campaigns of many top marketers.. It is also helping Ad Agencies, Ad Networks & Publishers to optimize ROI for their customers by helping weed out significant amount of fraudulent traffic which is negatively impacting all in the digital advertising ecosystem. The platform provides a visual analytics suite that displays data in an easy to action format, allowing Advertisers to block or blacklist traffic sources based on the analysis of 15+ reason codes that identify wide ranging variety of frauds including Click or downstream event hijacking, Click spamming, BOT activities, IP Fraud, Device fraud and many more. IAMAI is the leading non-government advertising industry body in India. Its mandate is to expand and enhance online and mobile value added services sectors. IAMAI also puts forward problems and requirements of the advertising and mobile community to consumers, shareholders, investors and the Government. IAMAI India Digital Awards is one of the most prestigious internet and mobile awards in Asia, winners of which are decided by an esteemed panel of jury members who come with decades of experience in the industry. According to Affle, the current version of mTraction FaaS has the potential to revolutionize the mobile user acquisition ecosystem, empowering app marketers across the globe. mFaaS is currently integrate-able using SDK or APIs and can also be integrated with leading third party attribution platforms, all without having to write a single additional line of code by the app owners.